I seriously have enough on my plate that I don’t need to be in charge of the main appetizer for my husband’s boys-night-out (in). But the 6 of them committed to this horrible thing (meaning the bringing of manly appetizers). And now I must, twice a year, be in charge of their adult beverages and munchies for their poker game. Not my thing to make appetizers for other people. But ok. Thank goodness I get to enjoy my little roam down the store aisles playing with the Living Wine Labels augmented reality app, and then choosing a bottle for them and a bottle for me, heh. I know it seems a little silly for an adult to be saying this (because I’m seriously embarrassed about how wine-illiterate I am), but I feel like I’m “getting to know” the wines personally before I make a choice. But, it is so much more enjoyable to buy wine now, especially considering how little I knew about wines before. For real, I used to just pick up something randomly and really fast, since I didn’t know what any of it was–and I felt way to shy and straight-up embarrassed to ask anyone, even in a liquor store–where THAT’S THEIR JOB. And yet, I am still a yellow-bellied chicken. Nope. 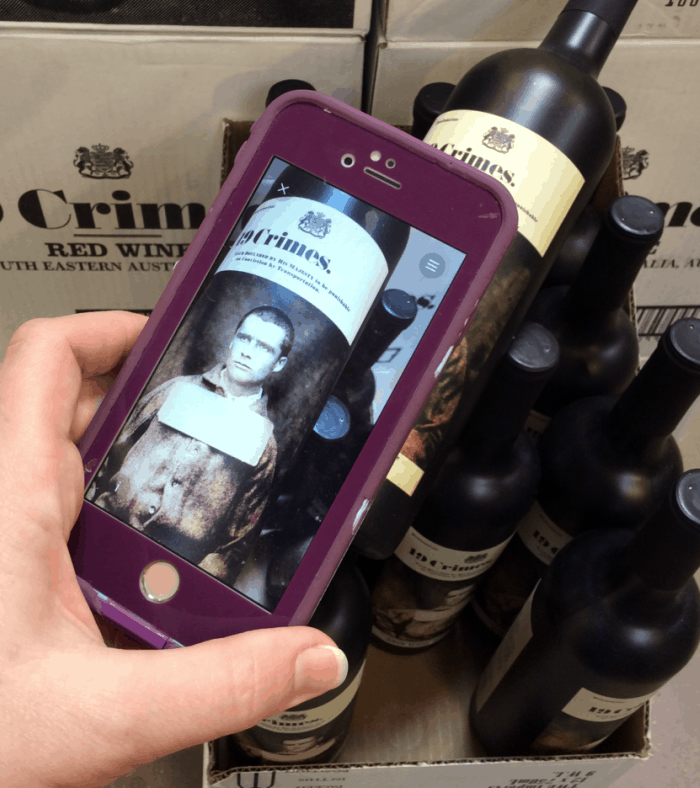 I have the perfect excuse to be lingering–I’m using this awesome Living Wine Labels app (which is free on Google Play Store and Apple Store and you can find out how to download it here). And, since I am more than a little amused just by that, it’s no wonder I’m learning more about the wine itself and actually taking the time to learn more about the vintages, why they matter, and what flavors might really pair with meals I’m planning. Mostly because I really love the 19 Crimes Shiraz. Would. Not. Have. Tried. That. Without the Living Wine Labels app. Such an authentic way of learning the stories behind your wines. Dude. I have no shame. Seriously. 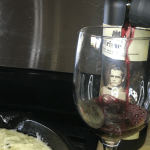 It’s great wine–and I totally wanted to see those dudes talk on the app. Heh. They have more than one line, even–like you just take your phone off them for a sec then come back and they’re up to more no-good. LOL! And their stories?! Yeah–how they turned-up with these 19 crimes (literally) and were sent off to Australia to become colonists and had no idea what they were getting into?! Ultimate random history-lesson (those of us nerds love) in the wine aisle. Er, hum…Back to the hubby. Yup. Made him some Dairy-Free Spinach Artichoke Dip. I had a little taster-bite and it was magnificent. So much so that I made it again for myself a couple days later when the fam was gathering and I said I’d bring a dip. 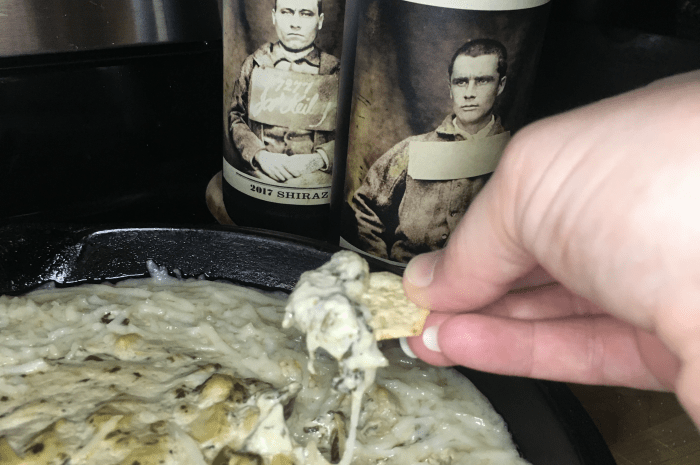 You should definitely pin any one of these awesome pics–and then get with the purchasing of some 19 Crimes wine (which can be found at Kroger, Ralph’s, and Fred Meyer), if you’re old enough…then make the dip and enjoy. Making a party appetizer like Dairy-Free Spinach Artichoke Dip can be a whip when it's not even for your party. But not this recipe--it is so easy, it rocks. Slice eggplant into 1/4-inch slices. Preheat oven to high broil (I know, I've never used this, but it's that OTHER button). Sprinkle course ground salt over both sides of the eggplant slices. Allow to sit on a cookie cooling rack for 10 minutes. Rinse both sides of eggplant slices in cool water, then pat dry with a kitchen towel. Lay eggplant out on a cookie sheet covered in foil and place in oven for 8-10 minutes, flipping the eggplant slices midway through the cook time. Remove eggplant from oven, then fold the edges of the aluminum foil around the eggplant. Allow the eggplant to steam this way for about 10 minutes. Peel (or cut--some peeled for me and some I had to cut) the skin off the eggplant rounds. Place eggplant into your blender with 2/3 coconut milk, sour cream, onion powder, salt and pepper. Blend until super-smooth. So satisfying. Remove eggplant mixture from blender and place in a bowl. Chop artichoke hearts into smaller bits. Mix-in, by hand, spinach and artichoke hearts into eggplant mixture. If mixture is not as thick as you'd like, mix the remaining 1/3 coconut milk with the cornstarch until will blended, then add to the eggplant mixture. Place eggplant mixture into an oven-safe pan or bowl. Place mozzarella cheese all around the edges of the dip. Pop it in the oven for approximately 15-minutes or until the cheese is browned a little.